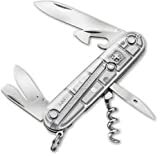 I bought the Victorinox Silver Tech Spartan to be my new every day carry knife, but I can’t bring myself to scratch such a beautiful piece of craftsmanship by sticking it in my pocket. The moment I pulled it out of its box, I was awestruck the the gorgeous Silver Tech scales. Pictures simply do it no justice. Of course, all the tools are of outstanding quality and very functional as well. All blades come very sharp, and the knife is well oiled out of the box so its easy to pull out the tools you need. The only con is that this knife is too beautiful to use! I’m probably going to give it as a gift because I can’t stand to damage it myself!